Heat dissipation in nanocrystals remains a major concern in the development of a wide range of technologies. Many appealing applications—such as displays, lasers, and hot electron photocatalysis—require intense excitation which results in significant temperature increases which have a deleterious effect on device performance. However, studying these thermal processes in nanocrystals presents unique challenges. Experimentally, the dimensions of these materials are well below the size limits accessible to traditional, contact-based probes. 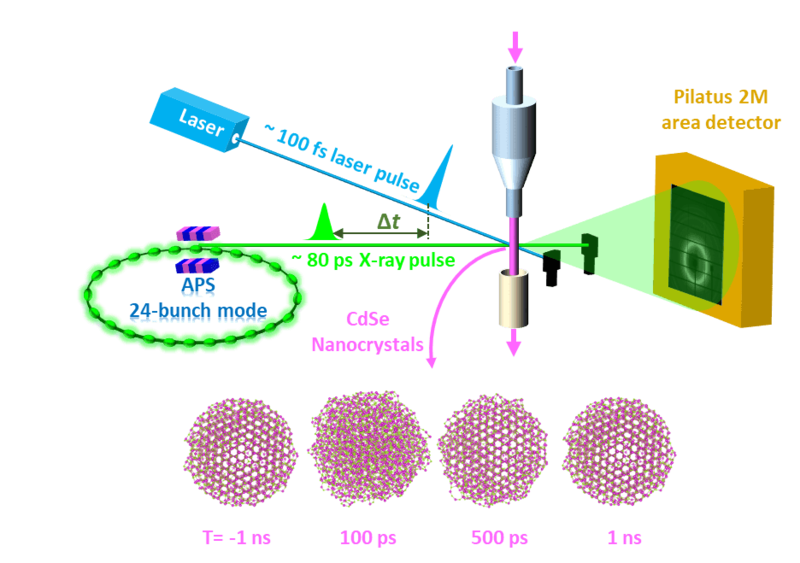 Consequently, we have applied a wide array of ultrafast spectroscopic techniques as non-contact means of studying thermalization. One such technique we employ is transient Raman spectroscopy which can directly monitor excitonic relaxation and phonon generation. 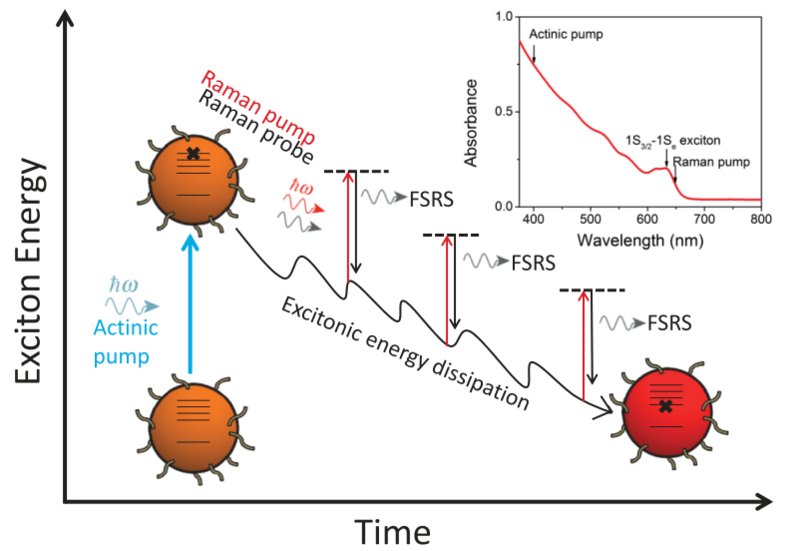 In particular, femtosecond stimulated Raman spectroscopy (FSRS) offers the spectral and temporal resolution necessary to track the (sub-picosecond) dynamics of low-frequency lattice vibrations. As shown on the right, we utilize FSRS to characterize phonon populations during intraband cooling. Another technique we employ is time-resolved x-ray diffraction (TR-XRD). Using intense optical excitation, we impulsively heat nanocrystals which, after a controllable time delay, we probe with an x-ray pulse to monitor the resulting lattice dynamics. This method has enabled us to characterize reversible, crystalline-to-amorphous transitions—melting—in semiconductor nanocrystals.